Everytime Pixar releases a new animation film, it feels like "this one can never be topped" but hey look here comes another one and you say "now this one sure couldn't be topped". Despite the sheer impossibility of flying your house by balloons (even with thousands of them), of it being unrealistic, the message of UP though, rings loud and true. That it is never too late to have an adventure. Whether you're 8 or 77, you can still make your own adventure, can still relive your long time dreams of adventure. That adventure can either be found outside the comfort of your own house but sometimes it can also be found there inside yourself. An adventurous "you" that haven't been let out. 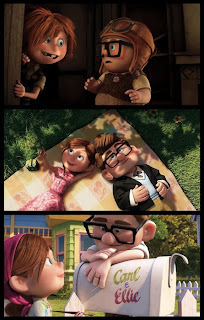 For Mr. Carl Fredericksen, his and Ellie's childhood dream was realized only after almost 7 decades but certainly time is nothing. For Russell, it started quite early. 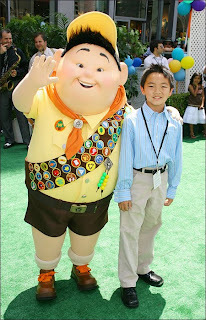 Kids' idea of "adventure" and having that adventure in reality is quite different, definitely different. Something that Russell realized somewhere along the trip. Their love story was the best 4 minutes of it all. 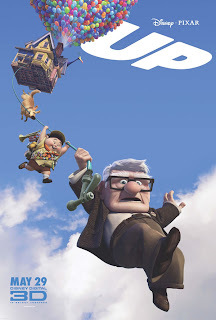 And while we adults cringe with the unthinkable scenes from the film (as kids all around shrieked with utter delight), I never doubted though the production's underlying message to all its possible viewers, to the humaneness of each characters, be it a bird, a child, a dog or a grumpy old man. 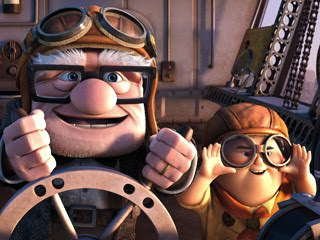 But perhaps, my favoritest scene in UP, the one responsible for tears welling up from my eyes so instantly, would have to be that scene where Russell was absently blabbering about fond memories of his always-absent father. Eating ice cream at Fenton's, counting blue and red cars and so on. He seemed so happy reminiscing about those days realizing how boring it sounded, but then goes on saying it maybe be boring but it's what he remembers best. Or something like that. I have to see it again and remember it word for word. But the essence is there. Russell was a kid who was just yearning for affection that his own father was too busy to give which he certainly found from Carl. And boy, Carl does not disappoint at the end. All in all, it was such a fun and heartwarming film that I sure as hell will watch again and again and again..
ang galing na magsulat ah :) galing nung review..
@ ponkan: next year naman Toy Story 3! That's why we have a lifetime for us to achieve our adventure. So Egypt? wag naman sanang 75 years old na ko ha!